We should back up a little first and explain (quickly) how we got here. 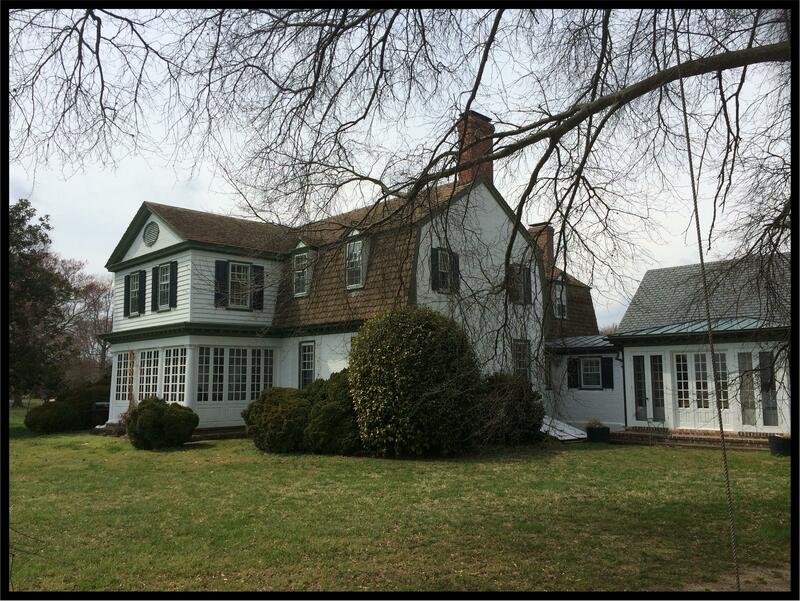 Toddsbury was one of the first properties in Gloucester County to have an historic preservation easement donated to the state historic preservation office (now the Virginia Department of Historic Resources or DHR). 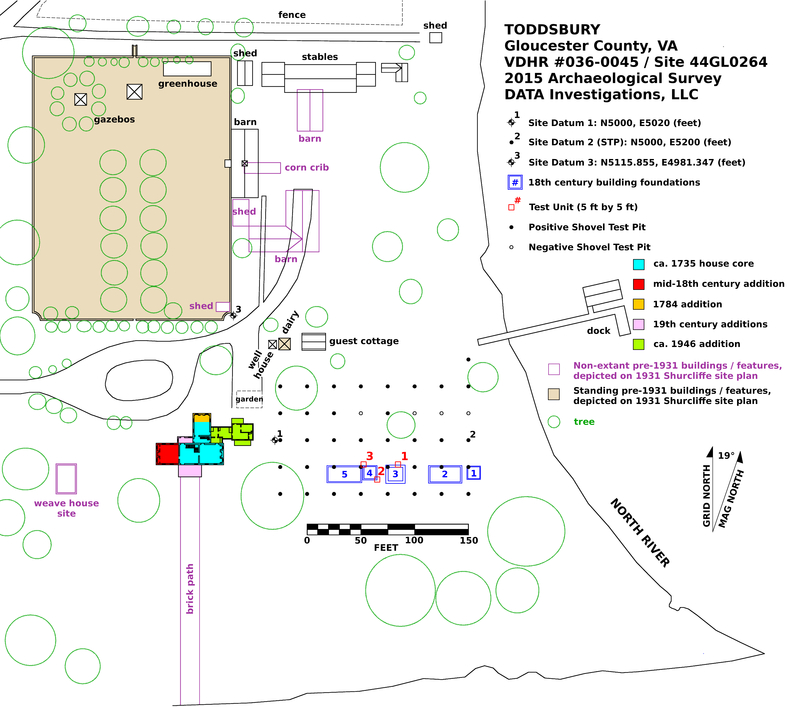 This covenant was put in place to protect Toddsbury’s historical fabric (architectural and archaeological), ensuring its integrity and acknowledging its significance to the history and residents of Virginia. When installation of an electrical line in the 1980s came across bricks in the ground, renowned historical archaeologist Dave Hazzard, regional archaeologist for the DHR, arrived to investigate. 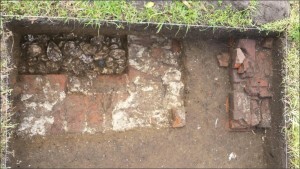 Hazzard quickly discovered that the utility trench cut through two 18th-century foundations. His map recorded their depth, width, and bondwork, while subsequent probing of the surrounding area helped him draw rough dimensions for each. His map remained safely tucked away in his files until Hazzard’s recent retirement when it reappeared, coincidentally, at the perfect moment. Fast forward to our first day of work on site. We established a grid, laid out a transect of shovel tests, and used a brick probe to re-locate Dave Hazzard’s two foundations. 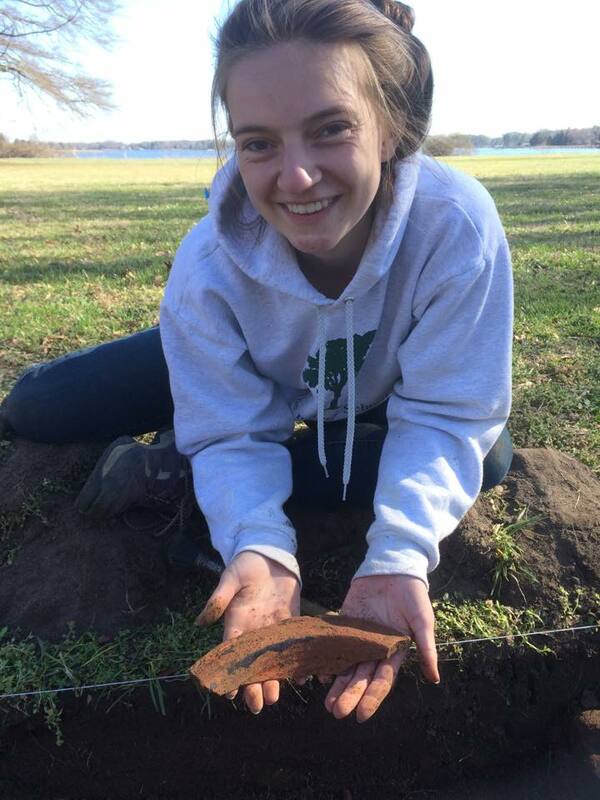 In short succession we found the first, then the second, and then we heard Anna Hayden (Fairfield Foundation Staff Archaeologist) say “I think there is a brick foundation in this shovel test pit!” But Anna wasn’t anywhere near Hazzard’s buildings. With her first shovel test of the day she hit the corner of a twelve-foot-square foundation, our third building of the hour. With her second shovel test of the day, she hit our fourth building. Not to be outdone, and observing that all four of these foundations shared the same north line, Thane grabbed the brick probe and quickly walked to the space between these four buildings and the main house…and found the fifth building. Five buildings…less than a day…a feat we will likely never experience again. 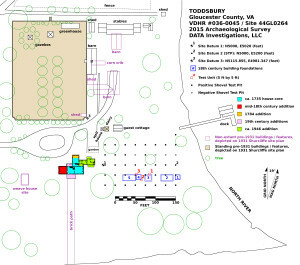 Toddsbury Site Plan created by Steve Fonzo. Click on image for larger version. Carter, Mollie’s grandmother, had spent part of her childhood at Toddsbury in the 1920s. She was as surprised as anyone by the finds. Her delight proved to be the most energizing. As she watched us patiently, we could hardly imagine what it would be like to think you know a property so well, and then have its history turned on its head. Mary, who would have been happy simply knowing how happy her mother and daughter were to be a part of this at the very moment of discovery, was the first to press us towards the bigger questions: What were these buildings? Who lived there? What can this tell us about the past? The simple answer to the first question is “We don’t know.” In fact, that answer works for the other two questions, too. But we can make some educated guesses. The westernmost building, closest to the manor house, measures 32’x16′ and is likely a duplex (two rooms) perhaps combining both a cooking area and laundry. 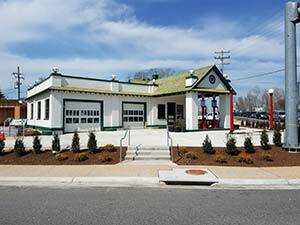 Moving to the east, the second building measures approximately 13’x13′ and may be a dairy. Less than twelve inches separate the two building foundations, and the eastern building apparently has a cellar. The third building measures 17’x18′, perhaps a small support building. After a 22-foot gap, which either served as an alley between buildings, or contains the as yet unidentified footprint of a post-in-ground or ground-laid-sill building, there is a second duplex, again measuring 32’x16′, perhaps a slave quarter. The fifth and final building, the first one found by Anna that day, is the smallest at 12’x12′ and may be a smokehouse or other small support building…its proximity to the water potentially factoring into its original function. 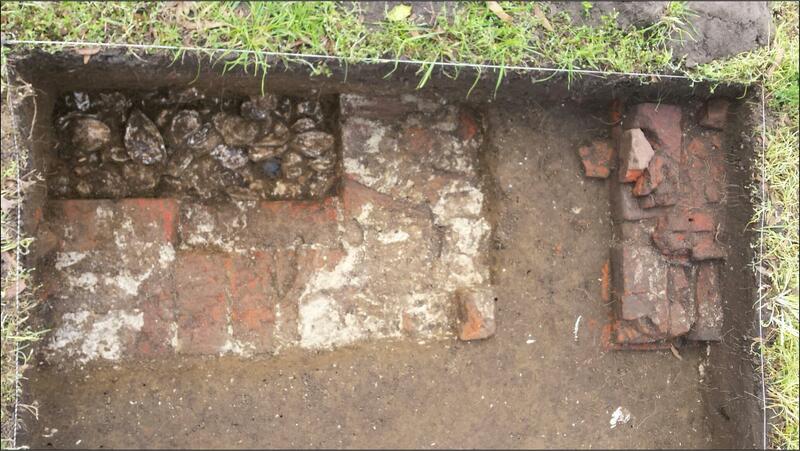 The excavations to date have helped confirm an 18th-century origin for these buildings, perhaps during the second half of the century, but analysis is ongoing. The coincidence of an amazing property, an engaged and informed family, and that moment of finding the right documents and artifacts at the right time, makes us appreciate just how special these moments are. Sharing that discovery at our recent fundraiser made that moment a touchstone for others to understand the significance of what we do. Further research in the field and archives over the next year, and the hours we will spend working with the owners of Toddsbury and the descendants of others who lived there, will hopefully build on this initial excitement. What we find as we proceed might very well trump these initial finds, and lead us all to see our shared past as exciting and full of potential discoveries that will once again change how we see our history and ourselves. My 7th great-grandfather, Major Thomas Todd, was born at Toddsbury in 1660. His headstone was moved to Ware Episcopal Church Cemetery in Gloucester. I’m so glad our historic home is in good hands! I’ve just discovered Thomas is my 10th great grandfather. Hello cousins! I have come across a first edition book written in 1928 by Katherine Helm the niece of Mary Todd Lincoln. This is an excerpt from the book on page 9: She writes ” The The Todds patented lands in Gloucester County, Virginia, in 1652 and “Toddsbury Manor” was their home. Thomas Todd was the builder of Toddsbury House in 1658—and by his will it passed to his son Thomas. The house built of brick, and the brick wall around the garden show extreme age. It is beautifully paneled on the inside. For generations it was the home of the Todds, who were noted for there lavish hospitality. There were a Christopher Todd and a Francis Todd in the family, as the tombstones show.” ——maybe a piece of the puzzle?!! I have Todd’s on my mother’s and father’s side and was tracing back to see where it led me. Thomas Todd III is traced back on my father’s side, but I know for a fact that Mary Todd Lincoln is from my mother’s side. If you are right, N. Nelson, then the Todd’s from both sides of my family are the same! Does anyone know if the second Bishop of Tennessee, Charles Todd Quintard, is any relation. Hello cousins… I found out that my 8th great grand parents are capt. Thomas Todd and Anne Gorsuch, Todd. I am happy to know that the history of this home is still in family hands and still exisits.